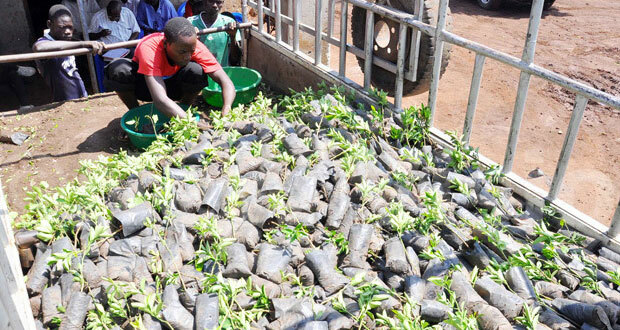 Leaders of Agali Sub-county in Lira district are in trouble for letting over two thousand mango seedlings supplied under Operation Wealth Creation to wither at the Sub-county headquarters. The seedlings were reportedly supplied in August but under unclear circumstances, they were not distributed to the intended beneficiaries. During a surprise field visit to the Sub-county headquarters on Wednesday, the coordinator Operation Wealth Creation for Lira District Maj. John Alonya confirmed the wastage and pledged to take immediate action on the responsible Sub-county officials. Alonya pointed an accusing finger at the Sub-county Chief Mr. Ocen Peter and the Extension Worker whom he said failed to perform their roles of informing the farmers to pick their seedlings. Mr. Okora George, a farmer from Adyaka Parish told Radio Wa they had no information about the seedlings, a reason why the seedlings were being wasted uncollected at the Sub-county headquarters. The Parish Chief of Adyaka Mr. Otim Saleh also corroborated the report of lack of information and attributing the mess up to the Sub county officials. But earlier on Tuesday the L C 3 Vice Chairperson for Agali Mr. Ocen George told a Radio Wa reporter on a courtesy visit that the seedlings were not demanded for by the farmers and were instead only being imposed on them. However this statement was denied by Maj. Alonya who argues that all the supplies under Operation Wealth Creation are demand driven. It is not yet clear what actions will be taken on the Sub-county leaders whom Maj. Alonya said their actions or in-actions that has led to the wastage of the seedlings worth over one million shillings, shall be included in his report to his supervisor and regional Operation Wealth Creation Coordinator for Lango, Col. Bosco Omure.